The module has been certified to comply with radio regulation or standards covering global markets that include North America, Europe, Japan, Australia and New Zealand. The RF certified module eases the burden for application and system developers from extensive RF and antenna design, and regulatory compliance testing, allowing for quicker time to the market. The module is ideal to build control or hub nodes of a wireless sensor network. 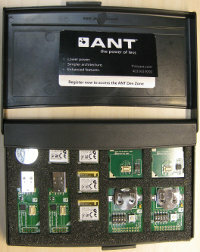 Registered dev kit owners receive direct ANT+ technical support from Dynastream Innovations.